This has been an unusual week. I went by the office to care for some things and as I was leaving I noticed our high-school girls’ volleyball team was practicing in the gym. I went in and played on my granddaughter’s side of the net. I served our side to an 11-0 run when a ball was hit over the net to our side and I dove for the ball and landed on the ball and rolled into the gym wall. Boy, did it hurt. I had a tough time that night sleeping. I went to the doctor and I have a cracked rib. Now, I have already lost one rib and gained a wife, but now I have a cracked rib. The doctor asked me if I learned anything and I said probably not! I was up at 3 this morning and my rib (wife) was up and so I fixed her a light breakfast. I showered, dressed, ate some grapefruit, Ezekiel bread, had my quiet time, and finished packing. I rolled the bags out to the car and Donny VanSike was kind enough to load the bags into the trunk of my car. He offered to drive me to the airport this week and he was a big help. Donny drove me to Tyler where I caught a flight to DFW and then on to Lexington, KY. Dr. Jeff Fugate was gracious enough to rent me a car for the conference this week. He met me at the motel and took me to lunch. We had a great time of fellowship. He then drove me by their college property and the church property. God has certainly blessed this man of God. CLAYS MILL ROAD BAPTIST CHURCH had over 2,000 in attendance last week and Dr. Fugate has been their pastor for 20 years. This man of God has started 24 churches in the state of Kentucky in recent years with a goal of 50. In the morning I will be driving some 50 miles south of Lexington to teach and preach for pastor Mark Eaton who pastors the CENTRAL BAPTIST CHURCH of Mount Vernon, KY. Sunday night I will be driving 30 miles south of Lexington to preach for Pastor Dan Bottrell who pastors the FAITH BAPTIST CHURH of Richmond, KY. 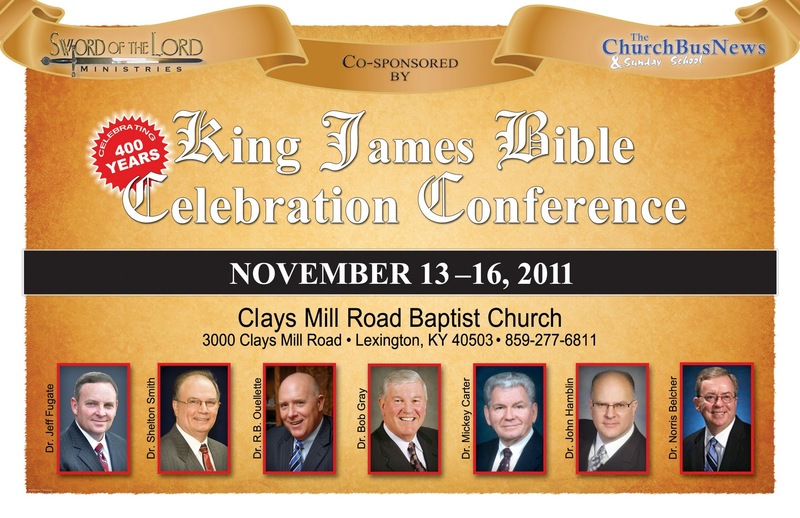 This is the week for the KING JAMES BIBLE CELEBRATION CONFERENCE hosted by CLAYS MILL ROAD BAPIST CHURCH of Lexington, KY. Dr. Jeff Fugate and Dr. Shelton Smith are co-hosts of this conference along with a great line up of men who love the Scriptures. In a day and time when many are following the uncertain sound of “originals only”for their Scriptures, there is still a remnant who have not traded the truth for academic relevance. This will make or break the next generation who are enamored by suave personalities who practice deception by using the false historicity of a Catholic lineage of so-called Scriptures to prove a non-inspired King James Bible. God can not only preserve an every word Bible, but he can also preserve the inspiration of an every word Bible for the English speaking people. Please make plans to attend this week. You will not be disappointed! GOTTA LOVE THE KING JAMES BIBLE.